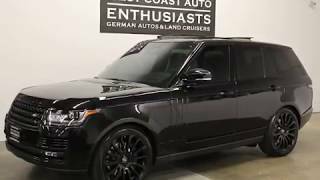 Land Rover will have the public debut of the Long Wheelbase (LWB) version of its full-size Range Rover at the 2013 Los Angeles Auto Show. It will be the first LWB Range Rover in 20 years. 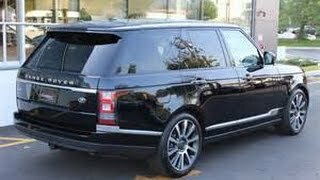 The long-wheelbase Range Rover models have 5.5-inches more rear seat legroom and when equipped with the optional executive seating package, increased seatbacks recline of 17 degrees. 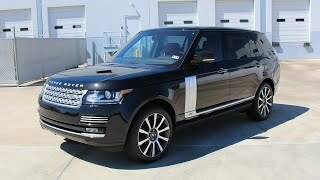 The 2014 Range Rover Autobiography Black will be available in long-wheelbase only for the U.S. Market. Exterior changes include a unique design and finish to the front grille, side vents along with badging in black enamel and chrome, signature rear lamps, a chrome accent finish to the tailgate and auxiliary vents to the front. A new exclusive 7-spoke 21-inch with a high gloss polished finish further differentiates the Autobiography Black. The new Range Rover Autobiography Black interior has been carefully crafted and tailored with the highest quality leathers and materials. Three exclusive interior color combinations are available with the Range Rover Autobiography Black at launch; Ebony/Lunar, Espresso/Tan and Dark Cherry/Ivory, the latter including a unique dual-tone seat.